As I was setting up my new phone tonight, I accidentally imported anyone who had ever emailed me with a Twitter account into Twitter and I followed them all - en masse - including my legion of trolls and haters. 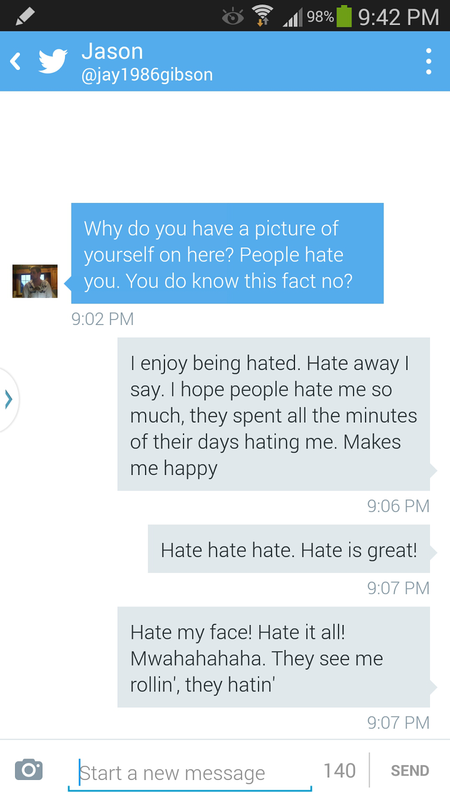 Utter hysteria erupted, followed by direct messages from haters who were "appalled" I chose to follow them. The accusation from one that I was stalking her reduced me to tears... tears of laughter. And that explains the random message from Twitter. Considering how I have an account and never use it, I was confused. To my legion of haters, it truly does. Damn...and here I thought I was special and we had some sort of social-media mutual interest or something.